Health care is a fundamental aspect when we consider our village based programs and outreaches. Of the global ill health reports, 24% of the cases are registered in Africa with access to very few health workers, averagely 3% to attend to the ill health problems. We lead a stead fast role to investigate and re-establish proper conditions that guarantee a standard community health. Provides opportunities for those who are sick at home to feel social existence around them as they receive hospitality, medical attention and appreciation. The vulnerable, especially the old get a chance to our air their views and feel important in participating to develop the community. 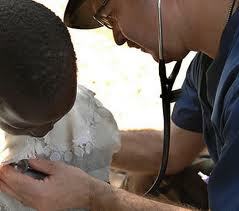 Medical camp and E.N.T : host voluntary medical camp periodically. To treat illnesses related to ENT i.e. ear, nose and throat and eye. Early childhood vaccination program (ECVP) : Take statistics and data on births (live and dead births) to follow the correct medical attention in a child’s life. Many mothers deliver at home which encourage transmission of HIV virus from mother to child, hence HIV/AIDS, alongside increase in infant mortality rate. We provide information and any necessary medical attention. Prenatal and postnatal care initiatives : Where expectant and breastfeeding mothers find medical attention and solution to personal capacity building. We aim at setting up clinic and healthcare programs to outreach the rural people in their village homes. -To provide a first-hand medication intervention for the people in the rural Kenya and establish community based health facilities within the villages as we outreach other people through mobile clinic systems. -Improve the sustainability of the community’s health capacity by mobilizing health workers, nurses, doctors and interns – home and abroad to create partnership under voluntary/charity programs to provide health care for the villages where we will train community health workers (CHWs) on health care issues as well. -Curb infant mortality rate by discouraging home delivery under the untrained midwives, but provide hospital delivery medical services that promotes the Prevention from Mother to Child transmissions (PMTCT) program to discourage the spread of HIV/AIDS from mothers o children. 1.Donation of drugs and or financial resources to buy them plus other treatment related equipment / aids (first aid kits, clinic facilities etc). 2.Mobile systems for movement like bicycles for the community health workers (CHW), motorbikes for the field work officers and a community ambulance for the patients that would need referrals. We invite the various civil society organizations (CSOs), charity organization (for doctors, nurses, interns, institutions, government etc), church missions (faith based organizations) FBOs, NGOs, individual or organizations and donors to join us. Its amazing it has really touched me you people out there are doing a nice job for the community Am interested and would like to join you.